I've been working so hard at work that I made this card thinking of the upcoming week-end and to "TAKE TIME FOR MYSELF" for the week-end. I used Stampin' Up's Sparkling Summer for the imagae. The little shells at the bottom middle of the card, were from a bunch of embellishments given to me by a girl I work with. They were just PERFECT. They started out white and I daubbed them with caramel and brown colored ink. I really like the simplicity of this card (simple was my inspiration)!! Hope you enjoy the card and your time off this week-end. TAKE TIME FOR YOURSELF!! how fun is this!?!? i love the simplicity of it! enjoy your day, taking time for YOURSELF!! that's always high on my priority list! you just gotta! I REALLY LOVE this one!!! I really like the simplicity too and the water looks AWESOME MOM!!!!! 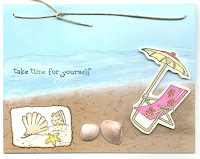 I REALLY-REALLY love the seashells on your new card!!!!!!!!!!!! !